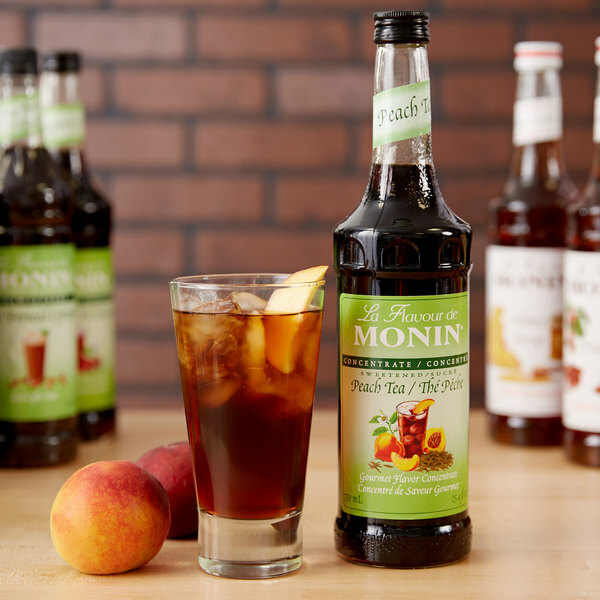 Quickly and easily make popular iced tea drinks with this Monin peach tea concentrate! Simply fill a glass with ice, and mix 1 oz. concentrate with 7 oz. water. Stir well and you're ready to serve! Made with pure cane sugar, this peach tea concentrate provides all you need to make refreshing beverages. Each bottle makes approximately 25 drinks. The sweet tea flavor with fresh, juicy peach notes is sure to please your guests. Packaged in a glass bottle, this concentrate makes an excellent addition to any restaurant, bar, coffee shop, or cafe. It boasts a sleek appearance for an attractive shelf presence and can easily be paired with a compatible pump for quick, efficient service during peak serving hours. Since 1912, Monin has had a passion for delivering premium products that simplify the beverage-making process. Their sense of innovation and creativity has led to a wide variety of flavors and recipes to suit any menu. 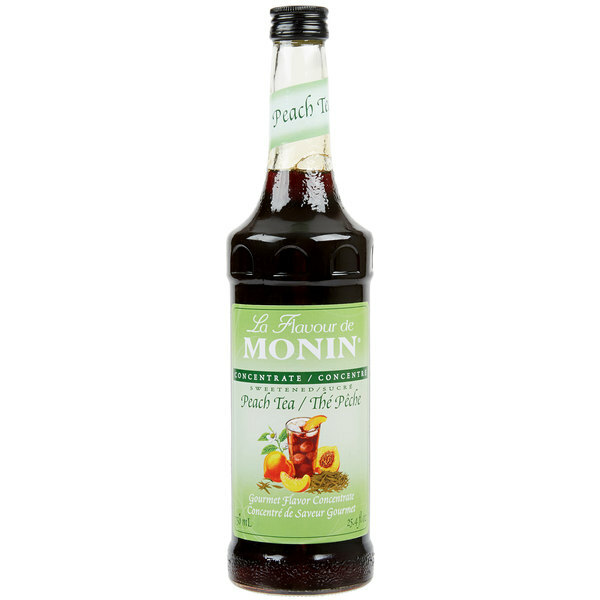 Use this Monin peach tea concentrate to craft superior beverages for your guests! The sweetness level of the peach tea concentrate is perfect. I put a pump on my bottle and use 4 pumps to 7 ounces of water, add ice. i used almost all of the peach tea syrup, such flavor packed into a small amount, and no meausuring the sweetness. it works out really easy. Excellent Flavor! It tastes like fresh peach tea. Super easy to mix a glass or even a batch. We have all four flavors: Peach, Mango, Raspberry & Lemon. Mix two together or mix with part lemonade or part water!